Back in April, I wrote a column about the Philadelphia “soda” tax. At that time, the tax was not a done deal, and a legal challenge was brought in September 2016. I thought I would provide some updates as to what has happened on this hot-button issue. First, a brief history of Philadelphia’s so-called sugar sweetened beverage (SSB) tax: Former Mayor Michael Nutter attempted to pass a tax on sugary drinks in order to address Philadephia’s expanding waistlines (Philadelphia continues to be one of America’s most obese cities) in addition to increasing the city’s revenues. In fact, in 2010 when Mayor Nutter first pushed for his SSB tax, approximately 60 percent of Philadelphia adults and 41 percent of Philadelphia’s children were obese. Mayor Nutter made two noble attempts to pass his SSB tax, once in 2010 and then again in 2011. Despite his best efforts, he was unsuccessful in convincing Philadelphia City Council to adopt such a tax. Mayor Nutter was not the only one to fail. There was even a city council member, Bobby Hennon, who proposed his own soda-tax in 2015 in a desperate attempt to fund the Philadelphia Public School District. Ultimately, taxes rose—parking, real estate, use-and-occupancy taxes—but no soda tax was put into place. When the new Mayor, Jim Kenney, took office, he attempted the same tax but had some advantages, including a better relationship with the city council and, most importantly, a city council that did not face reelection until 2019 (both Kenney and Councilmembers were elected in November 2015). Mayor Kenney also used different language to sell the SSB tax. Unlike Nutter, who focused on the health of Philadelphia, Mayor Kenney attempted to promote the SSB tax by stating he would use the revenue to expand universal pre-K, a widely popular policy. For these reasons, the SSB tax successfully passed in Philadelphia in June 2016. Beginning in January 2017, the Philadelphia Beverage Tax would take effect — a 1.5 cents tax per fluid ounce. Philadelphia was one of many American cities seeing success in passing SSB taxes. 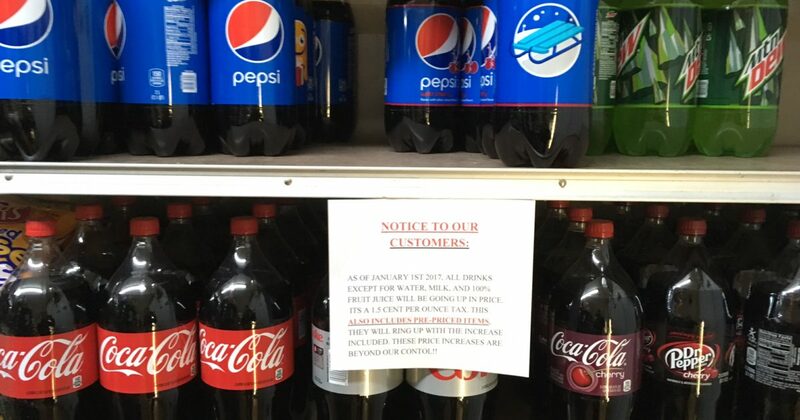 Currently, there are several American localities with a form of soda-tax: Philadelphia, PA; Boulder, CO; Cook County, IL; and four in California: Albany, Berkeley, San Francisco and Oakland. The Navajo Nation also has a tax on sugary drinks, as well as junk food. Most recently, in February 2017, the Mayor of Seattle, WA proposed a SSB tax. The passage of the tax did not come without a fight. The American Beverage Association was among the loudest critics of the tax, arguing the costs would be passed directly on to the consumer, and that companies would be forced to cut jobs, or close the doors and leave town. The state sales tax pre-empts the new tax (pre-emption doctrine: if the Commonwealth prevents it, local legislation cannot allow it). Since sugary beverages can be purchased under the Supplemental Nutrition Assistance Program (SNAP), the tax would also be imposed on SNAP – violating both state and federal rules. The tax violates the Uniformity Clause of the Pennsylvania Constitution (similar products taxed uniformly). In December 2016, the Philadelphia Court of Common Pleas dismissed the case in its entirety. You can read the summary here. This allowed the law to take effect on time, in January 2017. The effect is a 1.5 cent per ounce tax on all beverages with added sugar. The tax is also included diet drinks. There are some exclusions: baby formula, medical food like Pedialyte and products containing 50 percent by volume of milk – and those milk substitutes meeting the United States Department of Agriculture Nutrition Standards. And a few other exceptions. The tax took effect January 1and the first date of collection was February 20, so the reporting has just come in. In its first month, the tax generated $5.7 million, well above the 2.3 million predicted. Despite generating revenues, some companies such as Pepsi-Co are laying off workers due to the decrease in sales associated with the tax. While soda sales in Philadelphia have decreased, those stores in the surrounding area are seeing increases – raising questions about whether people are traveling to purchase their sugary beverages elsewhere. With only one month of data to report, it is still too soon to determine the effects of the SSB tax. Only time will tell if the effects of the Philadelphia Beverage Tax will fizzle out.